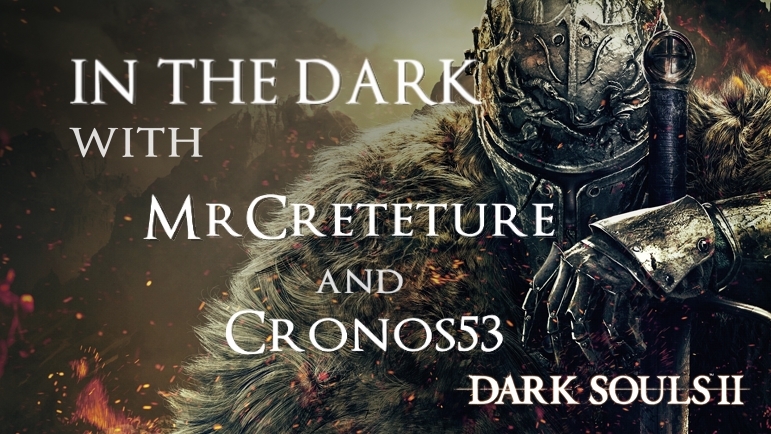 Welcome to In The Dark, a stream show following Scholarly Gamers MrCreteture and Cronos53 as they venture through the Dark Souls game series by FromSoftware. Each week, these two will test their mettle by digging into the lore, gameplay, and challenge this series has become famous for. Josh (MrCreteture) made his way through Bloodborne with the help of Steve (Cronos53) and decided to continue through the rest of the games as a blind playthrough (having never played them before), starting with the most controversial game of them all, Dark Souls II. Each episode will be broken up between two parts every week, showing most of the highlights and multiplayer sessions of the stream. If you’d like to see more, be sure to catch them live every Monday at 9:30 PM EST for the full 2 hour stream sessions. Josh starts his first journey into Dark Souls II: Scholar of the First Sin with some difficulties, but manages to pull through the Forest of Fallen Giants quite well. Grouping up with Steve, they tackle the entire first area — along with some side areas that some may not know exist — ending with the boss kill in the Forest and retrieving a key. Along with some great deaths, good laughs, and possible hidden boss battles taken care of. Many different paths branch out from the death of the Last Giant. Leading towards Heide’s Tower of Flame, the Lost Bastille, and a couple side doors still unopened. Find out where these two decide to go next time on In The Dark. The Scholarly Gamers Dark Souls II Stream-Through with MrCreteture and Cronos53 goes live every Monday at 9:30 PM EST. If you can’t catch it live, be sure to check our YouTube or www.scholarlygamers.com every Tuesday and Thursday for the episodes.